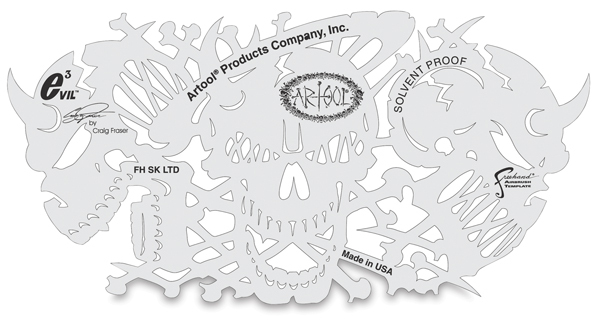 Artool Evil 3 Freehand Templates put a devilish new spin on the old adage to see no evil, hear no evil, speak no evil. 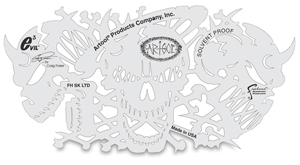 Featuring a trio of skulls with their eyes, ears, and mouth stitched shut, they give you an awesomely easy way to add killer skull graphics to all your airbrush projects. These templates were drawn by hand by Craig Fraser, a driving force in the automotive and motorcycle kustom paint industry. Featuring one design in four different sizes, they let you create identical images on everything from full-size trucks to RC cars. Made of the toughest, solvent-proof plastic, you can easily flex or curve Evil 3 Templates around any irregular-shaped surface. Then simply clean them up and use them again and again. The set includes templates in sizes Small (3" × 5½"), Medium (4½" × 8"), Large (6" × 11"), and Extra Large (7½" × 15"). ®Artool is a registered trademark.® Freehand is a registered trademark. ™ Evil 3 is a trade mark.